Tanya – I did a What’s In My Bag post last year, and a few things have changes since then. I do have a few different bags, but the one pictured is my big “I’m going to be out all day” bag. 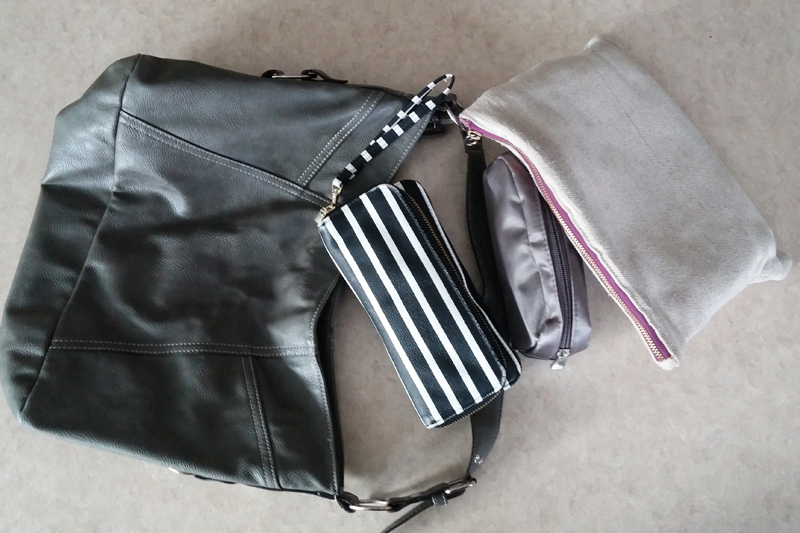 ❧ Nine West Wristlet that has my phone in the outside zippered pocket, wallet, gum and/or mints + checkbook. A lot of times, I just take this out and leave my purse in the car if I’m going to run a quick errand, or hit up the supermarket. ❧ I also have always have a book + sunglasses in the summer. Of everything in my bag, perhaps the one thing I love the most is the wristlet because I can just grab it and go and it’ll have my purse + phone + keys. ❧ My gray bag is so old that I can’t remember where I bought it from. ❧ Nate Berkus Pencil Pouch from Target – This is where I keep a stash of diapers and wipes. ❧ Toiletries Case – Bert’s Bee’s Rose Lip Balm, Aveeno Daily Moisturizing Lotion, Sunscreen. ❧ Wristlet Striped Wallet – old from Target. In here you’ll find my bank cards, loyalty cards, library cards, and a bit of change. I rarely have cash on me and I don’t have a checkbook. ❧ Ipod with audiobook, sunglasses, snack & drink for the toddler, spare clothes for the kiddo, and keys. I don’t carry a planner with me right now but keep one on my kitchen counter and carry a small notebook instead.